Read nextManned missions, moon shots: what else can we expect from SpaceX for 2018? 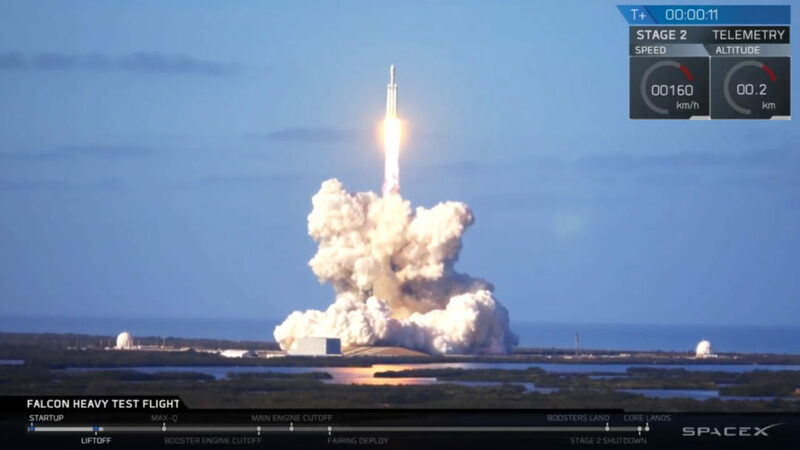 After numerous delays, SpaceX has finally delivered the first test flight of its Falcon Heavy rocket. Billed as the most powerful operational rocket available right now, Falcon Heavy is expected to be the vehicle of choice for future Moon and Mars missions. The rocket lifted off at 10:45pm SAST (3.45pm local time), following a delay due to weather concerns. For the test flight, SpaceX and Tesla founder Elon Musk decided to use his own Tesla Roadster as a dummy payload. The result, as the above image shows, speaks for itself, as the rocket and payload successfully left Earth. The rocket’s three first stage boosters separated successfully, with two boosters coming back to Earth in an upright position. At the time of writing, it was unclear whether the third booster, scheduled to land on a drone ship, made a successful landing (update: TechCrunch reports that the third booster “hit the water at 300mph” due to several engines failing to ignite). Watch the replay of the Falcon Heavy launch below — skip to the 28 minute 50 second mark for the one minute warning. Manned missions, moon shots: what else can we expect from SpaceX for 2018?